(by Nico Daams, Februari 28, 2014) After 17 years, the Kapingamarangi translation committee on Pohnpei completed their final session. The last verses and spelling issues have been looked at, final decisions have been made, and in just a few weeks the Bible can be sent to the printer. We all praised God for His faithfulness over these past 17 years. The first meeting took place on Kapingamarangi atoll in February 1997. We started with 23 translators, a few new ones joined, some translators passed away, but 17 translators are seeing their work come to an end. For 17 years we have all been studying God’s Word, and we all agreed that it has been a wonderful experience. The chairman of the committee, Caleb Gamule, is the only team member who still continues checking my latest version with his, and adjusting his version where necessary. After this step we find there is very little left to be adjusted by me; then I send the text to Paulus Kieviet, the typesetter in Holland, who completes each book the same day he receives it. Caleb completed Isaiah during the week I was there, and expects to finish in about two weeks. When I asked him what he thought about the translation work he has been doing all these years, he simply beamed with joy. 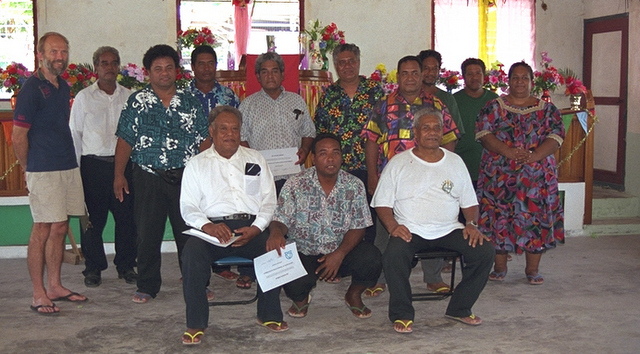 This was the translation committee at the time of the New Testament dedication on Kapingamarangi atoll in 2000; this is when they made it quite clear they wanted the whole Bible, not just the New Testament. Of the twelve translators on this photo, four have died.